The study of human body measurements on a comparative basis is known as anthropometrics. Its applicability to the design process is seen in the physical fit, or interface, between the human body and the various components of interior space. 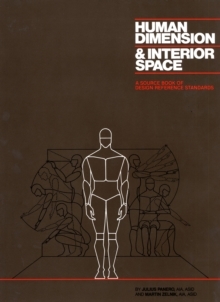 Human Dimension and Interior Space is the first major anthropometrically based reference book of design standards for use by all those involved with the physical planning and detailing of interiors, including interior designers, architects, furniture designers, builders, industrial designers, and students of design. The use of anthropometric data, although no substitute for good design or sound professional judgment should be viewed as one of the many tools required in the design process. This comprehensive overview of anthropometrics consists of three parts. The first part deals with the theory and application of anthropometrics and includes a special section dealing with physically disabled and elderly people. It provides the designer with the fundamentals of anthropometrics and a basic understanding of how interior design standards are established. The second part contains easy-to-read, illustrated anthropometric tables, which provide the most current data available on human body size, organized by age and percentile groupings. Also included is data relative to the range of joint motion and body sizes of children. The third part contains hundreds of dimensioned drawings, illustrating in plan and section the proper anthropometrically based relationship between user and space. The types of spaces range from residential and commercial to recreational and institutional, and all dimensions include metric conversions. In the Epilogue, the authors challenge the interior design profession, the building industry, and the furniture manufacturer to seriously explore the problem of adjustability in design. They expose the fallacy of designing to accommodate the so-called average man, who, in fact, does not exist. 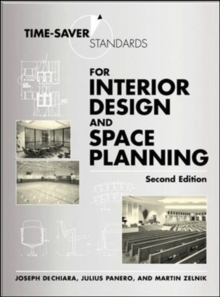 Using government data, including studies prepared by Dr. Howard Stoudt, Dr. Albert Damon, and Dr. Ross McFarland, formerly of the Harvard School of Public Health, and Jean Roberts of the U.S.
Public Health Service, Panero and Zelnik have devised a system of interior design reference standards, easily understood through a series of charts and situation drawings. With Human Dimension and Interior Space, these standards are now accessible to all designers of interior environments.